The Cactus Team pick their top free things to do during a visit to Berlin: Cactus offers German language courses throughout the UK and in Berlin. To book any of our courses please call us on 01273 830 960 or email us. Our multilingual team will be happy to answer any questions you may have. Checkpoint Charlie is a tangible reminder of the historic divide between East and West. Although the Berlin wall came down in November 1989, Checkpoint Charlie remained an official crossing until German reunification in 1990, when the guard house was removed. Now, in its place, there stands a copy of the guard house and serves as a reminder of this divide and much celebrated unification. On the first Sunday of every month anyone, including tourists, can enter free of charge all the state museums and attractions including: the Pergamon, Alte Nationalgalerie, Altes Museum, A�gyptisches Museum, GemA�ldegalerie, Neue Nationalgalerie, Sammlung Berggruen, and the Museum for Gegenwart. A trip to Berlin is incomplete without a visit to Germanya��s Parliament building, the Reichstag. There are some great views of the city at the top of the glass dome and entry is free. The Brandenburg Gate, Berlina��s most photographed and iconic structure is nearby. Opening in May 2005 and designed by architect Peter Eisemann the Holocaust Memorial is just south of the Brandenburg Gate and is made of more than 2,700 giant concrete slabs. It is a unique structure and is intended to produce a sense of confusion and uneasy, representing a a�?supposedly ordered system that has lost touch with human reasona��. Even if youa��re not a car lover this is a great place to visit. Located on Friedrichstrasse at the corner of Unter den Linden the VW showroom has every type of VW known to man. With 3 floors of automobiles and technology the basement also showcases the space travel developments that VW has been involved in. 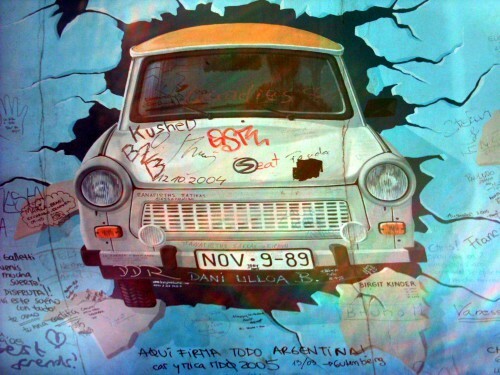 The East side Gallery shows more than 100 pieces of art, all painted onto the Berlin Wall. With many famous images this gallery is open-air so try and view on a sunny day. Next Next post: What Language Should You Learn?